“When my son was blinded on one eye, I told my husband about the movie 'Aankhen' where people couldn’t see yet they are capable of having a normal life. I was sure that Rishikesh would have a normal life. I believed we will train him to use his weakness as his strength. 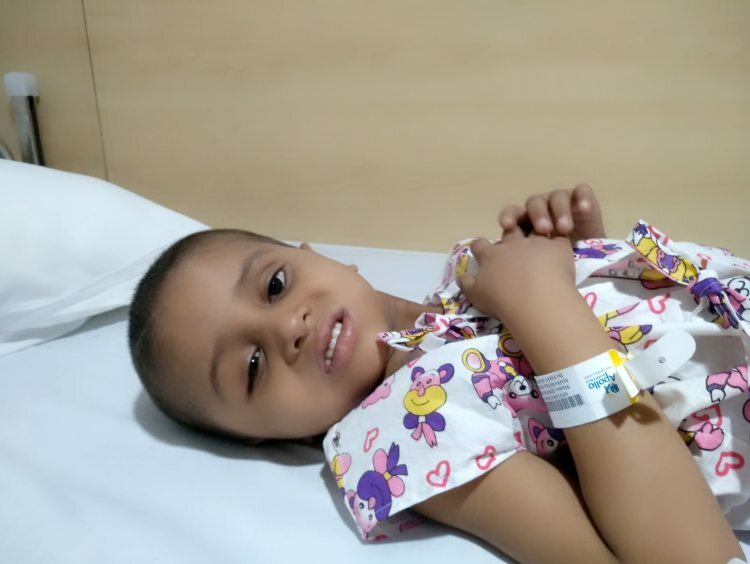 With his cancer spreading gearing to kill him, I don’t know if he would get the chance to grow up." Mamta and Lakshminarayan have been traveling 350 km in over-crowded passenger trains since their 4-year-old son was a baby. For kids, birthdays are very special. 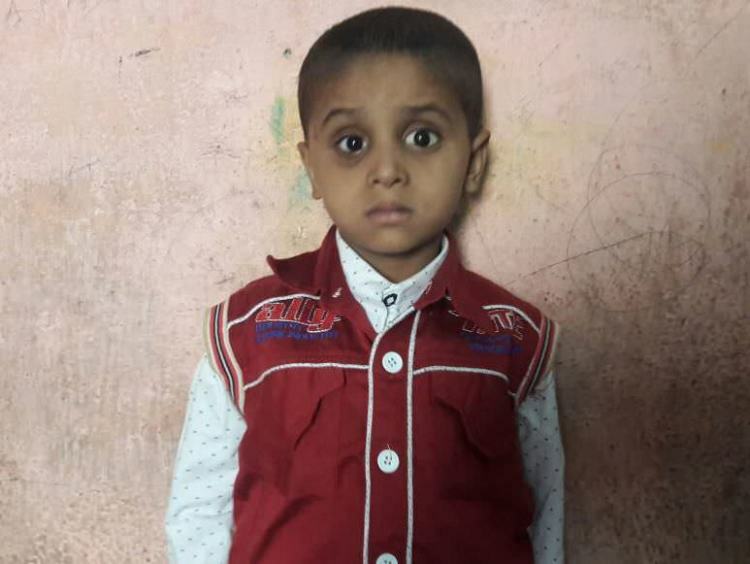 But for Rishikesh, his second birthday shattered his happy childhood forever. The little boy started itching his eyes so much that it seemed he would gouge them out. Soon after the diagnosis, cancer stole Rishikesh's vision. 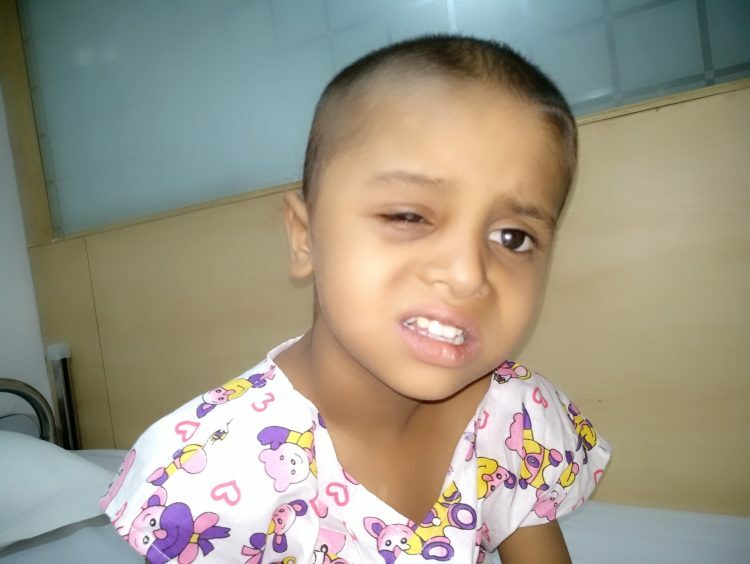 His right eye had to be operated to stop cancer from spreading. Even though he was blinded, the parents were more than happy to see him alive. The happiness lasted a short while until they realized cancer had already affected Rishikesh's other eye. Without urgent treatment, he will go blind, and lose his life. “When we heard the treatment plan, we were shaken. He has not responded well to the usual chemotherapy. 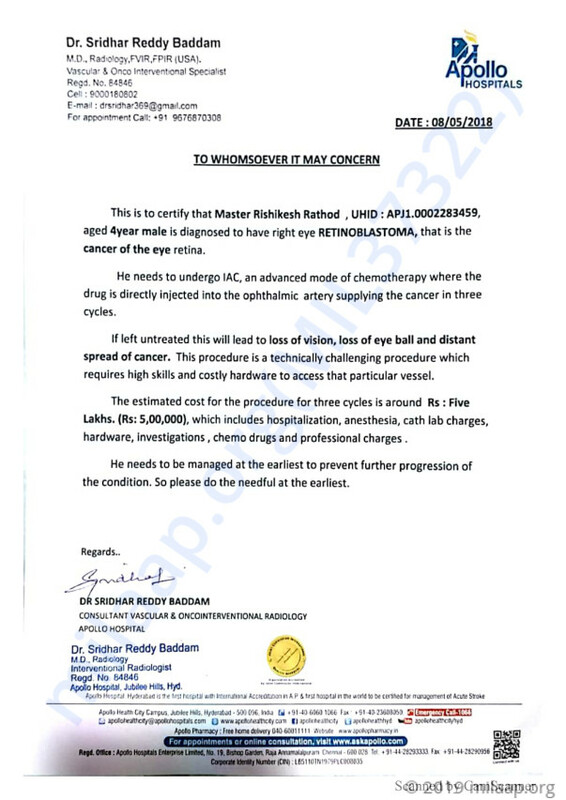 He has to undergo specialized chemotherapy for his eye where the medicines will be put directly to the nerve connecting the brain and retina. 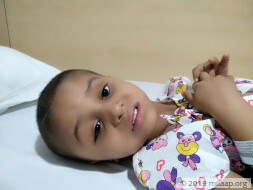 While this kind of chemotherapy has a little risk that my little baby might suffer a stroke, it is our only shot at saving him." Lakshminarayan and his brother jointly own a tea stall in Bijapur, Karnataka. They also have a very small plot of land where they harvest pulses. This year they suffered a huge loss. 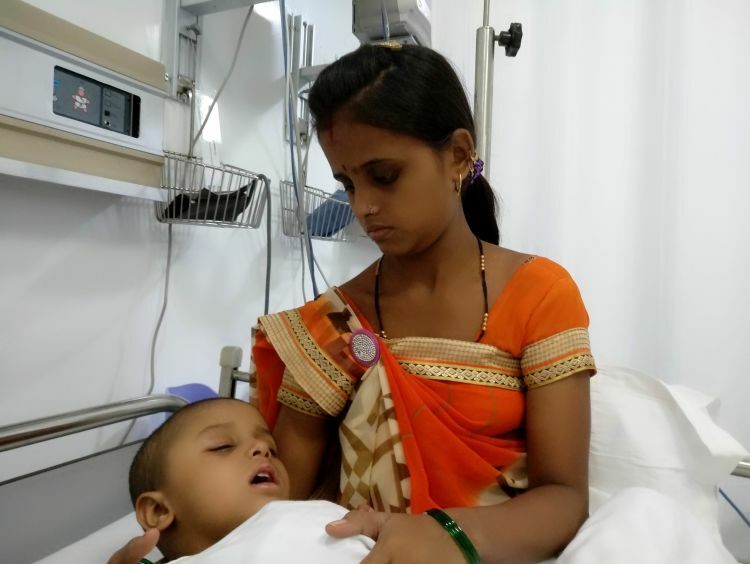 Lakshminarayan and Mamta have to go to the hospital very frequently now. His brother manages the work when he’s away. Unfortunately, without another hand to help, the business is suffering. Lakshminarayan and his brother jointly make Rs 7000 a month. 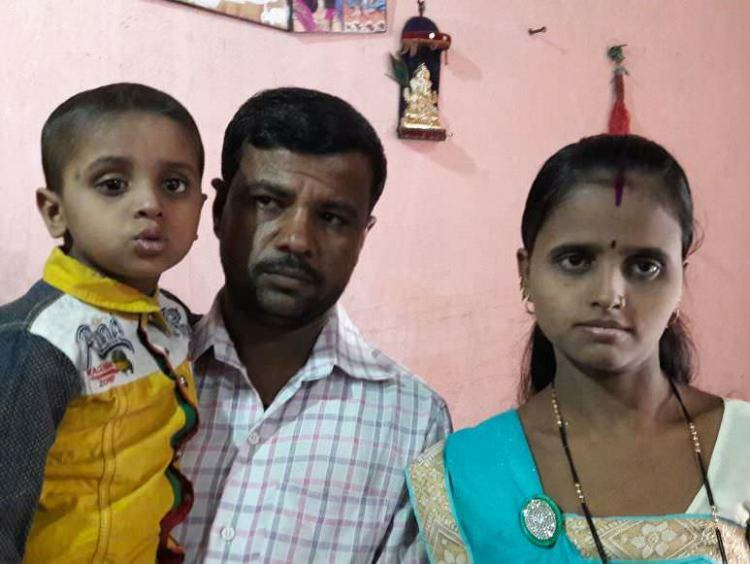 He has spent Rs 1.5 lakh from his own pocket and borrowed a lot to save his son. With the increased cost of specialized chemotherapy, he is running out of funds to fulfill the bills. Little Rishikesh has to undergo specialized chemotherapy for 3 weeks at the earliest. Without the treatment, he will lose his life. 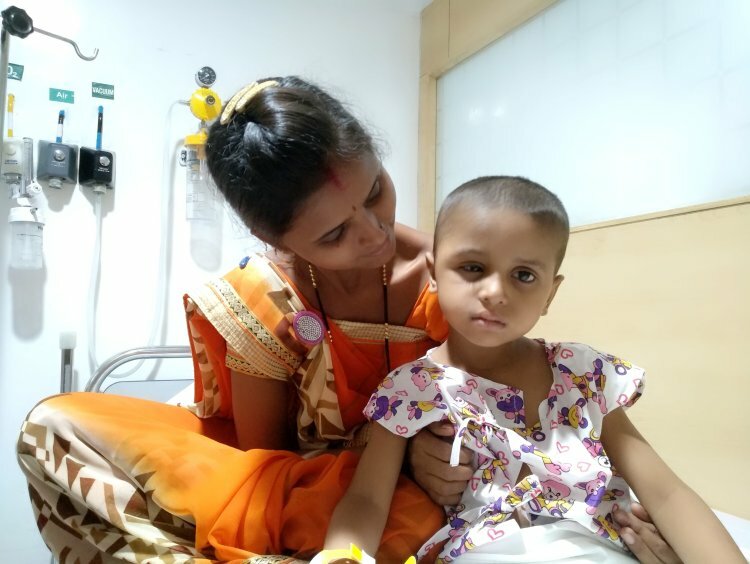 The cost required to save the little child now is Rs 5 lakhs. He has already been blinded in one eye. This boy does not deserve to lose another or his life to cancer. Your support will help this child to continue to see the beautiful world. Thank you all for your love. Rishikesh is doing well. The kid is at home now and is under regular follow ups with the doctor. He is stable now and is recovering. Rishikesh was unable to see from one eye earlier, but now he is unable to see from both his eyes. This started last month. As of now, he is receiving laser treatment for the same. The doctors say that they will be able to see results slowly. We are all hoping he recovers. Please keep him in your prayers.